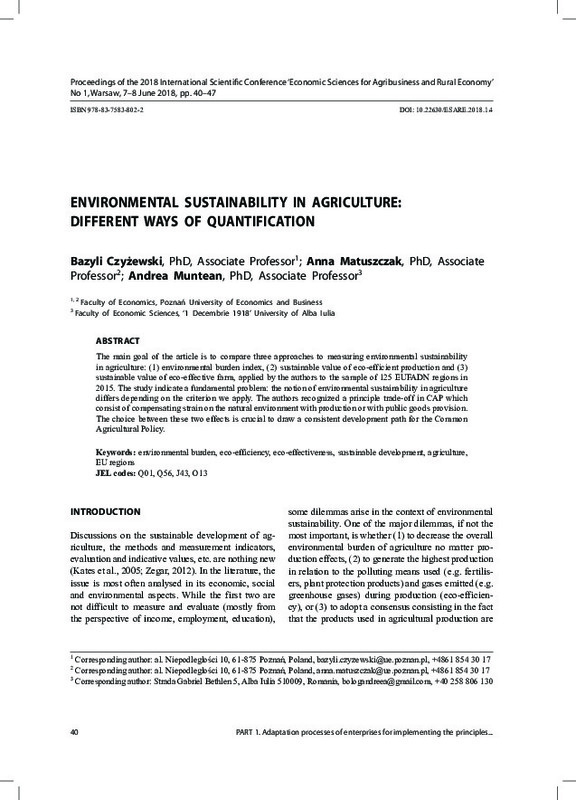 The main goal of the article is to compare three approaches to measuring environmental sustainability in agriculture: (1) environmental burden index, (2) sustainable value of eco-efficient production and (3) sustainable value of eco-effective farm, applied by the authors to the sample of 125 EUFADN regions in 2015. The study indicate a fundamental problem: the notion of environmental sustainability in agriculture differs depending on the criterion we apply. The authors recognized a principle trade-off in CAP which consist of compensating strain on the natural environment with production or with public goods provision. The choice between these two effects is crucial to draw a consistent development path for the Common Agricultural Policy.